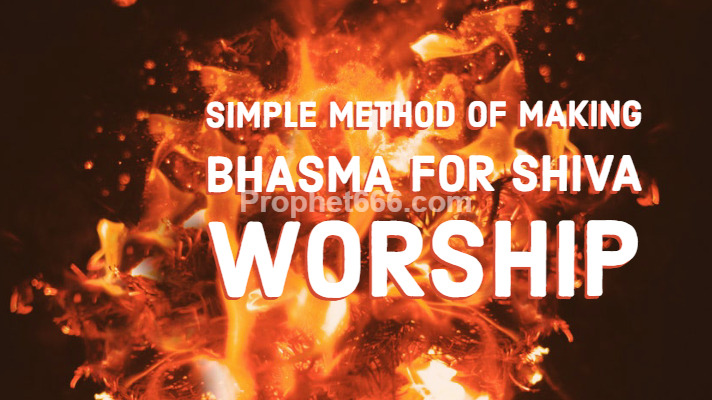 In this post, I have described a simple method of preparing Bhasma at home. Applying Bhasma on the body is an integral part of Shiv Bhakti. However, most people are unwilling to apply Chitta Bhasma or the ashes of a dead body on their bodies, hence, they can prepare and use homemade Bhasma by following the procedure described in this post. There are more than one methods, including some secret methods of preparing Bhasma and energizing it with Sacred Mantras. The simple and easy to implement method of making Bhasma at home, described below, is also useful and beneficial for sincere and dedicated Shiv Bhakts. 1] Take seven Samidha or sticks of wood, which are use to light a Havan. These sticks are a part of Havan Samagri. 2] Then, hold these sticks in your hand and chant the Mantra given below for 1 Mala or 108 Mantra Chants. 3] Then, once again hold the seven Samidha in your hand and chant the Mool Mantra of Lord Shiva given below for 108 Mantra Chants. 4] Sprinkle a little bit of Gomutra or Cow Urine on the Samidha and a little quantity of cooked rice and Ghee and then light the Samidha. 5] When the Samidha has turned into ash, store it in a Peetal or Brass Container. A Rudraksha Japa Mala is best suited for counting the number of Mantra Chants. This Bhasma has been infused with the Mool Mantra of Lord Shiva and a Mantra to remove sorrows, unhappiness, poverty and disease. The Shiv Bhakt can then use this Mantra Infused Bhasma as and when needed or during the daily worship of Lord Shiva. A pinch of the Bhasma should be applied on the chest after having a bath, there is no compulsion for applying thw Bhasma on the forehead. Sir how to prepare chita bhasm for blessings of shiva..